"We provide honest repairs, installations and inspections with personal attention to detail, at competative pricing." 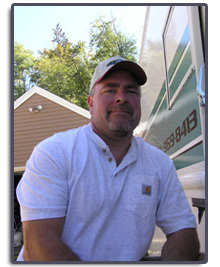 My name is Glen Baker, the owner of River City RV Repair. I began building RV's in 1984 at Beaver Coaches in Bend Oregon. Since then I have worked with many dealerships on PDIs, deliveries and repairs for all classes of RV's. Here at River City RV we focus on acheiving the ultimate goal... HAPPY CUSTOMERS! Not only do I offer repair services, I also offer on the spot mobile RV inspections and deliveries for individual RV buyers or Dealerships. Need to accessorize your RV? I install satellite dishes, awnings or anything else you may want or need. Operating out of Sandy Oregon, I provide service to the great Pacific Northwest. Oregon Building Codes Division RV Repair & Alteration Cert. © 2012 River City RV Repair, L.L.C.